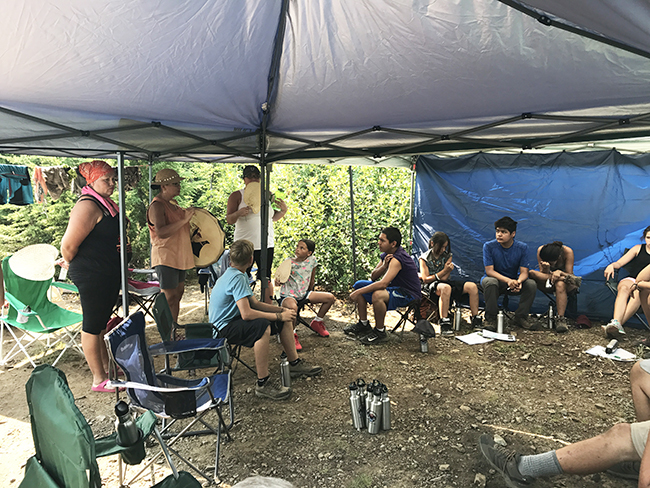 Mountain Camp 2017 kicked off with Kelly Moses storytelling and preparing the kids for their mountain journey, in the longhouse around a fire. 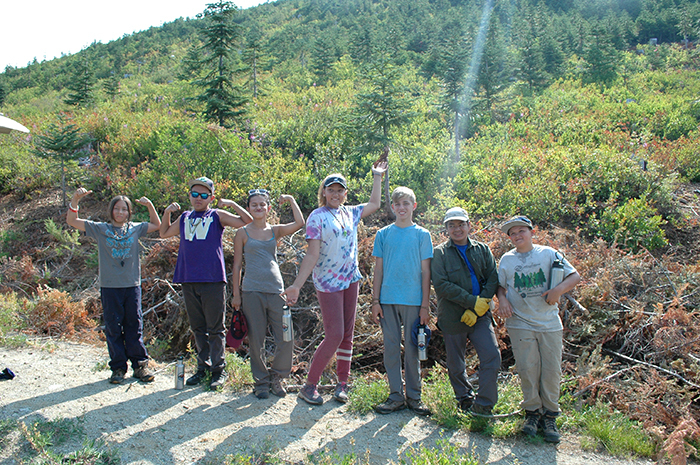 With guides Ross Fenton and Matthew Moses, the group then went to swədaʔx̌ali, our co-stewardship area in the Mt Baker-Snoqualmie National Forest, where they participated in our huckleberry restoration work. 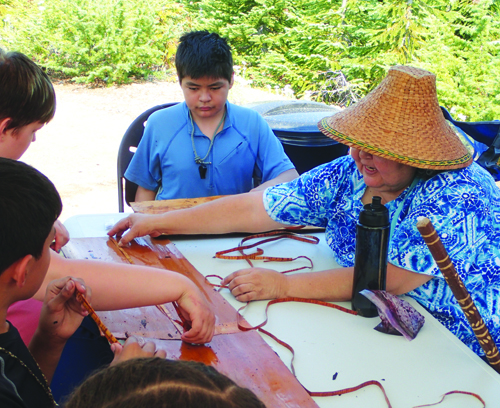 The kids joined Chelsea Craig, Patti Gobin and Melissa Gobin in cedar weaving and making cedar headbands. Natural Resources Department staff members Ryan Miller, Daryl Williams, Ross Fenton, Matthew Moses, and Zach Lamebull talked with the youth about careers in natural resources. It was hot at 5,000 feet, but nights were just right and skies were starry. Michelle Myles from the Lushootseed Department and I spent Thursday night at camp, with Michelle telling stories under the stars before bed. 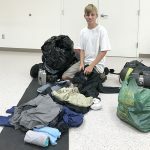 As before, kids learned to set up tents, carry their own gear, cook in the wilderness, conserve water, and support each other, and about their mountain culture. Once again, Inez Bill helped contribute to the program with her ideas and feedback on our curriculum. For the first time this year, we ended camp with a river trip. 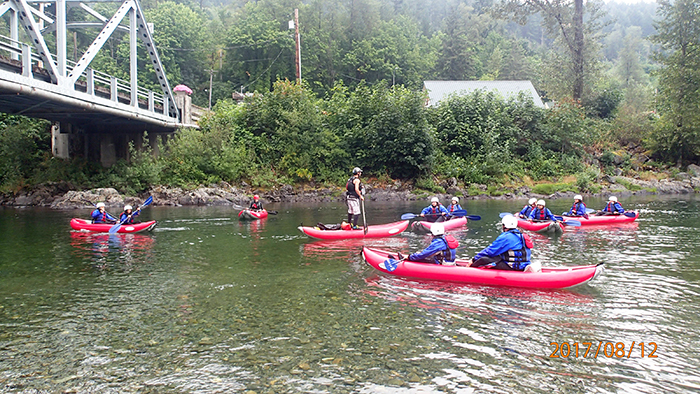 Kids got a lesson in kayaking and suited up for a three-hour downriver trip starting at the bridge in Skykomish. 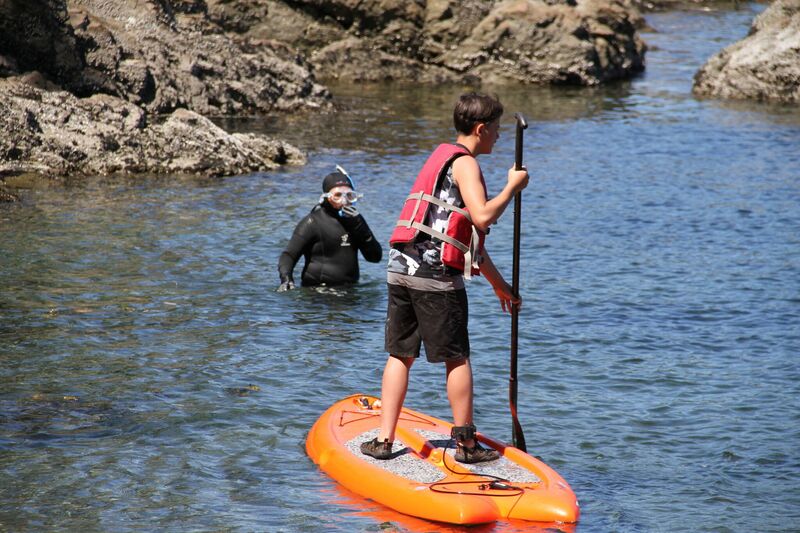 We contracted with Outdoor Adventure Company of Index, and the kids seemed to love it! Annually, the Tulalip Tribes and the U.S. Forest Service hold a meeting regarding the Memorandum of Agreement (MOA) the two parties signed in 2007. The aforementioned MOA was created so that the Tulalip Tribes and the U.S. Forest Service can collaborate on the decision-making, planning, and counseling for the conservation of Tulalip’s resources on off-reservation ancestral lands in the Mt. Baker-Snoqualmie National Forest. This year the meeting was held on May 12, 2016. Tulalip Tribes Chairman Mel Sheldon and Forest Supervisor Jamie Kingsbury sign an historic and important agreement, the swədaʔx̌ali Co-Stewardship Plan, 2016-2026. 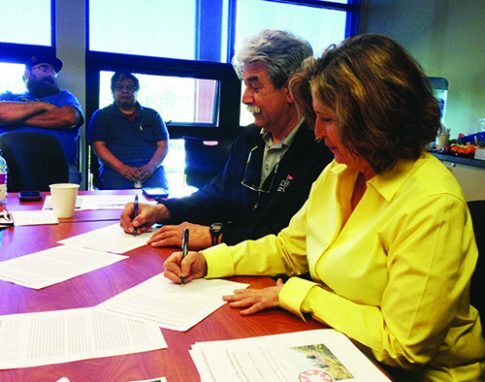 During 2016’s MOA meeting Chairman Sheldon and Forest Supervisor Jamie Kingsbury signed an historic and important agreement, the “swədaʔx̌ali Co-Stewardship Plan, 2016-2026”. The agreement, a provision to the MOA, is a culture resource management plan that covers the swədaʔx̌ali area over the next ten years. 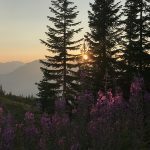 swədaʔx̌ali or “Place of Mountain Huckleberries” is a 1,280-acre parcel in Tulalip ancestral lands in the upper Skokomish watershed that the Tulalip-Forest Service Co-Stewardship looks to enhance. One of the many reasons this is important to the tribe is the huckleberry. Northwest huckleberries are generally picked in the late summer/early fall seasons, and grow in the damp areas of mountains. 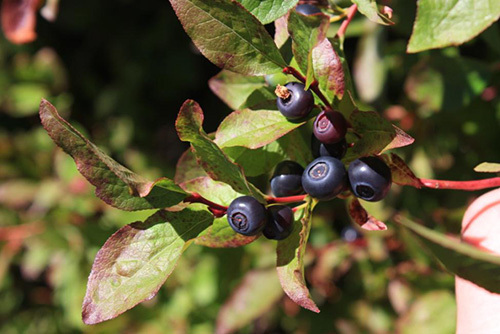 The huckleberry, known for boosting the immune system, has always had a strong relationship to the indigenous peoples of the northwest. Coastal Native American ancestors considered the huckleberry to be of the utmost importance because of the medicine the plant contains. 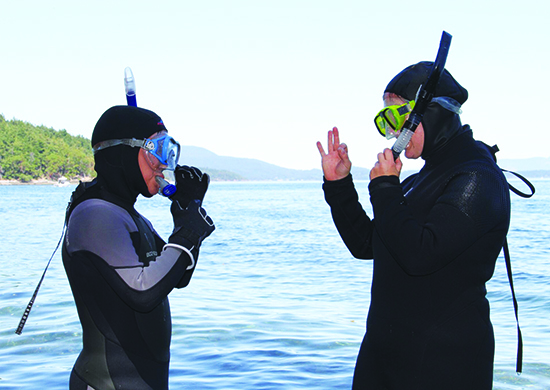 Inez Bill, Tulalip Tribes Rediscovery Program Coordinator, provided a foreword for the swədaʔx̌ali Co-Stewardship Plan. In the foreword Inez spoke of the significance huckleberries and the spiritual connection Natives have with the berry. Inez writes, “Huckleberry is a food and medicine to our people. Our ancestors visited certain areas for gathering these berries. They knew where the berries were growing, and what companion plants were growing there too and how to utilize them.” Like fishing and hunting the huckleberry is essential to the Native American culture. Preserving these plants requires a lot of love and care. 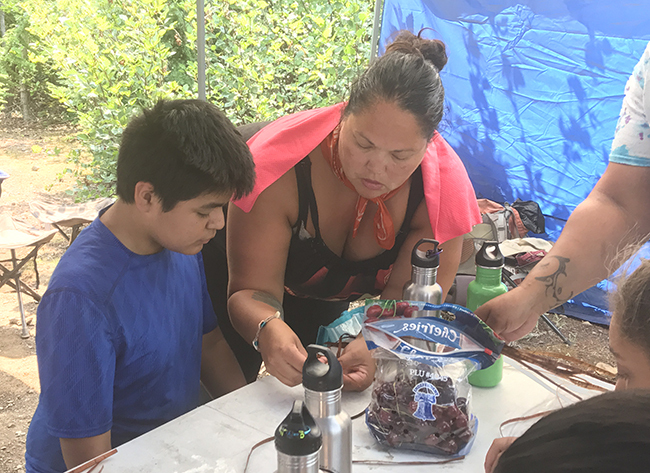 Inez stated that caring for the swədaʔx̌ali area offers a chance to pass on the knowledge of the huckleberry and it’s harvest to Tulalip’s future generations. 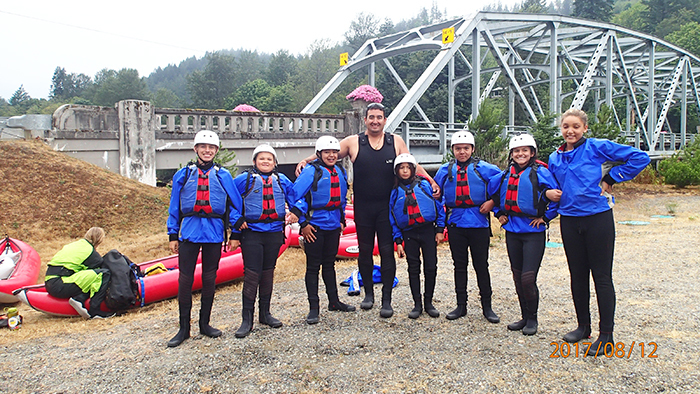 Tulalip Tribes Natural Resources Environmental Policy Analyst, Libby Nelson, agrees that passing the knowledge to the youth is essential to preserving Tulalip’s natural resources. 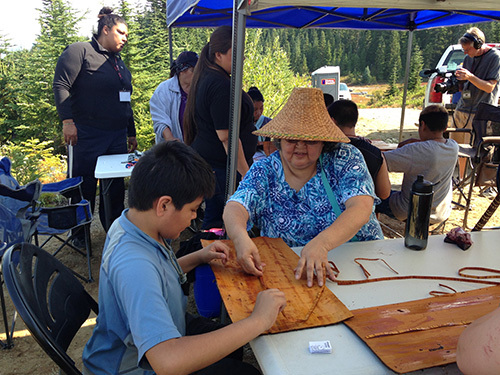 The co-stewardship between the Tribe and the Forest Service is a way to ensure that Tulalip cultural traditions live on. Libby states, “Treaty rights encompass more than an opportunity to pick berries, hunt game or harvest fish. Having a meaningful role on the ground, in the stewardship of these resources, helps reconnect tribal peoples to these lands and the teachings of their ancestors”. 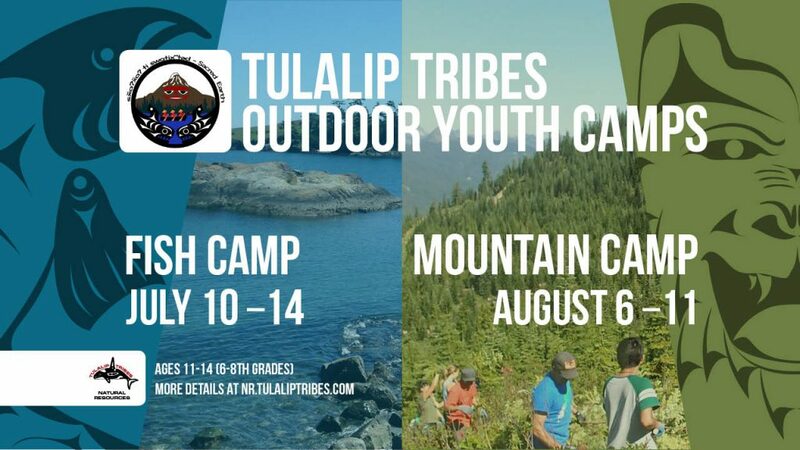 Last year the Tulalip Tribes hosted it’s first Tulalip Mountain Camp at swədaʔx̌ali for the youth of the Tulalip community, and looks to make it an annual trip. 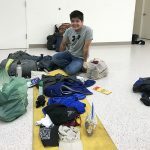 Inez detailed the trip stating that the youth were able to experience a connection to the mountains and ancestral lands, which in turn allowed the youth to bond with their families and community members by sharing what they learned and observed during their experience. 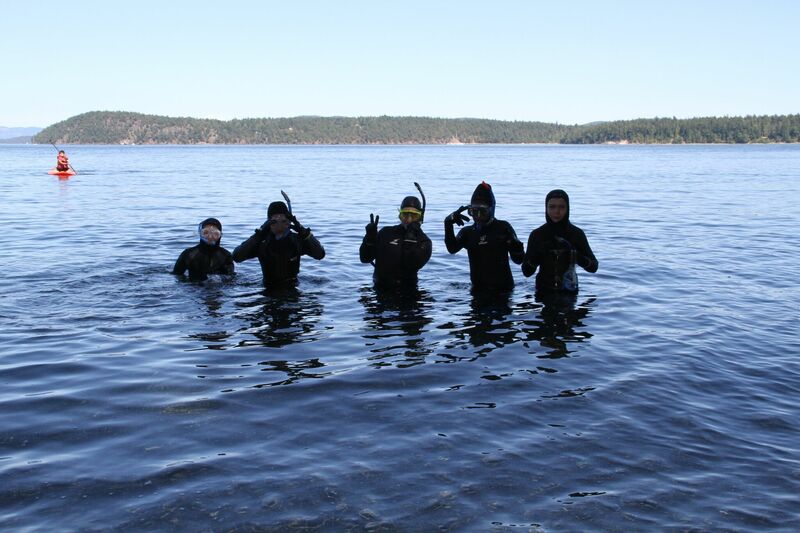 Tulalip’s Natural Resource Department and the Tulalip Youth workers will manage the swədaʔx̌ali area incorporating both traditional practices passed down from the ancestors and western science while nurturing the plants. 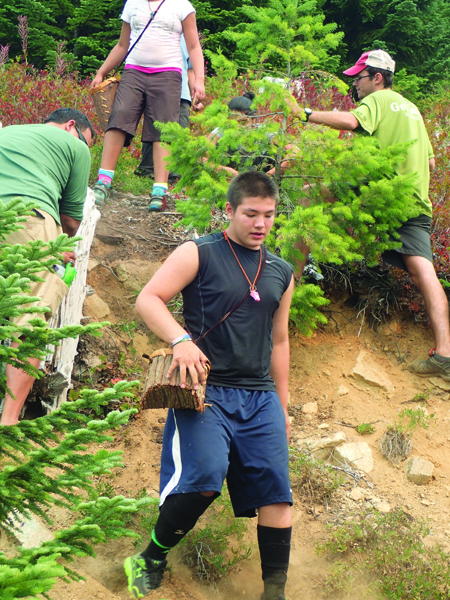 The Natural Resource Department is looking to engage both summer youth workers and Tulalip Mountain Camp attendees to help remove the small conifers that are now about two-feet tall and have has many as 22,000 per acre. According to a Seattle Times article from 1946, families camped, sometimes for the whole picking season, while gathering huckleberries. 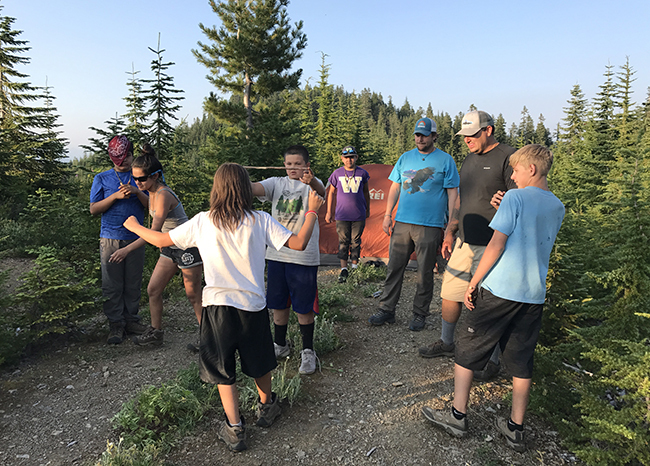 Gathering huckleberries was considered a fun social event where families from different tribes would travel to take part in the festivities including games, dances, and singing. Ceremonies were also held thanking the creator for the vitamin packed berry and asking for a blessed harvest. Often referred to as a superfood, huckleberry offers an abundance of benefits to its consumer. For example, these berries contain large amounts of antioxidants, which help aid in the prevention of many diseases such as cancer, diabetes and heart diseases. In today’s society diabetes is a prevalent disease in communities all across Native America. The huckleberry is a reliable food that diabetics can enjoy without elevated blood sugar levels. Huckleberries are used in a variety of recipes including tea, pie, and jam. When used for medicinal purposes the huckleberry can be applied to treat pain, heart conditions, and infections. Wilderness. The wild. Whether intentional or not, using the world “wild” to designate landscape and environment sets the land apart from us. Americans are civilized, Natives are savages, and the land is wild. Sound familiar? Because of American formal education and informal borrowing of traits from other cultures, Americans believe they can visit the wild, but can never live in it. 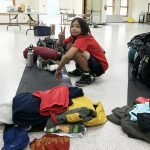 Americans are trained to think that those who do choose to live in the wilderness are either Natives (read savages) or half-crazed tree huggers. But the concept of wilderness was obsolete the minute it was born. We, as a Native society and Tulalip people, know every inch of this land used to be Indian Country. Every inch. There is not now, nor has there ever been, a “wild” or a “wilderness” on this continent. All things are related. This notion of connectedness to all things was so central to our ancestors, to the very essence of Native culture, but has dissipated as generation after generation of Native peoples have found themselves urbanized; slowly transformed by the contemporary world of independence, big cities, and a relentless dependence on technology. So then how can we reasonably begin to understand our ancestors, their actions, thoughts, and values? If we live in a modern time that is inherently different in nearly every respect than the time of our ancestors, how can we truly grasp the culture we stem from? The culture we fight to hold onto, both externally and internally, every single day, while the world around us constantly tells us to give it up, get with modern times, and stop looking backward, look forward. There is no simple solution, yet as we look around we can clearly see a persistence and resurgence of Tulalip culture that we refuse to let die. 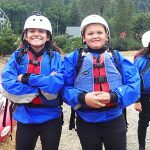 There is the plan for Lushootseed immersion classrooms, the stead-fast work of our Rediscovery Program, the restoration of the Qwuloolt Estuary, and, most recently, the reintroduction of our ancestral mountainous areas to a new wave of Tulalip citizens, known as Mountain Camp 2015. 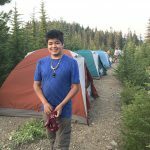 The idea behind Mountain Camp helps us begin to answer the critical questions about how we keep in touch with our ancestors in modern times. Instead of bringing traditional teachings to an untraditional space, we learn our ancestral teachings in an ancestral space, to walk as they walked. The pristine swədaʔx̌ali co-stewardship area, located 5,000 feet up in the Skykomish Watershed, was a space where our ancestors once resided. It was a place where they hunted, gathered, and lived only off the sustenance the land offered them. Most importantly, after all these years, the swədaʔx̌ali remains a land our ancestors would recognize today, unhampered by urban cities and deconstruction. “I think for our youth to be up in the mountains it is critical for them to get a strong, firm understanding of who they really are as Tulalip people,” says Patti Gobin, Tulalip Foundation Board of Trustee. “It’s been a long time since our people, our children in particular, have been allowed into these areas. After the signing of the treaty, we were confined to the reservation at Tulalip, and many of us grew up thinking that’s all we were, Tulalips from a reservation. But we are far more than that. From white cap to white cap, as Coast Salish people, this was our ancestral land and it means everything to have our children up here to allow the spirits of our ancestors to commune with them and talk to them, and for them to experience what it is to be out in the wilderness, the way we have always lived. 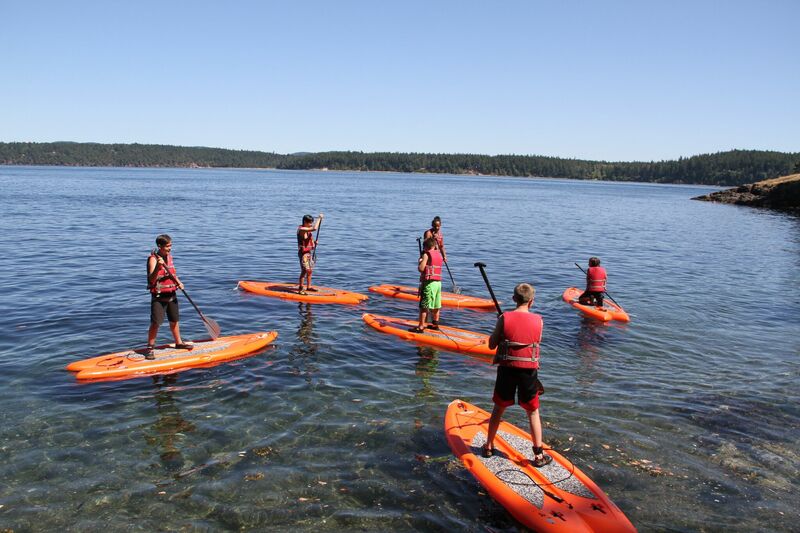 For the inaugural Mountain Camp 2015 (held in mid-August), three camp leaders led eight Tulalip tribal members, all 7th and 8th graders, in the experience of a lifetime. They spent five days and four nights in the swədaʔx̌ali and surrounding areas living as our ancestors lived; setting up and taking down camp as they moved locations, singing, storytelling, making traditional cedar baskets, foraging, berry picking, preparing meals, building fires, using the crystal clear lake to cleanse their bodies and spirits, learning traditional values in the sacred land, and coming together as a supportive family. 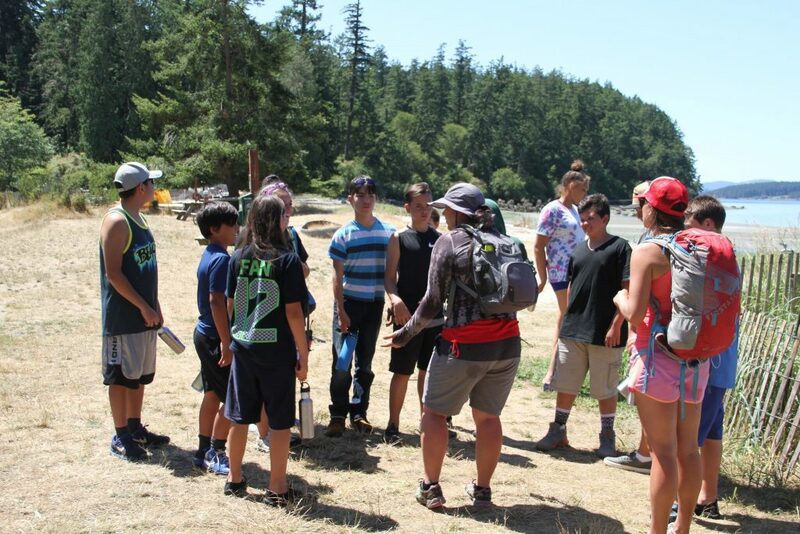 In order to give the Tulalip youth the most impactful experience possible, the Natural Resources Department teamed with Cultural Resources and Youth Services to develop two main themes for the camp: reconnecting to the mountains and x̌əʔaʔxʷaʔšəd (stepping lightly). Both themes aspire to reunite the children with teachings and values central to our ancestors; recognizing the connectedness of all things while respecting the Earth. In keeping with their traditional teachings the youth introduced themselves to the mountains and forest that make up the swədaʔx̌ali region. They took turns stating their names, their parents’ names, and the names of their grandparents. The mountains took notice and later that night swədaʔx̌ali formally introduced itself to the kids in the form of a glorious show of thunder and lightning. 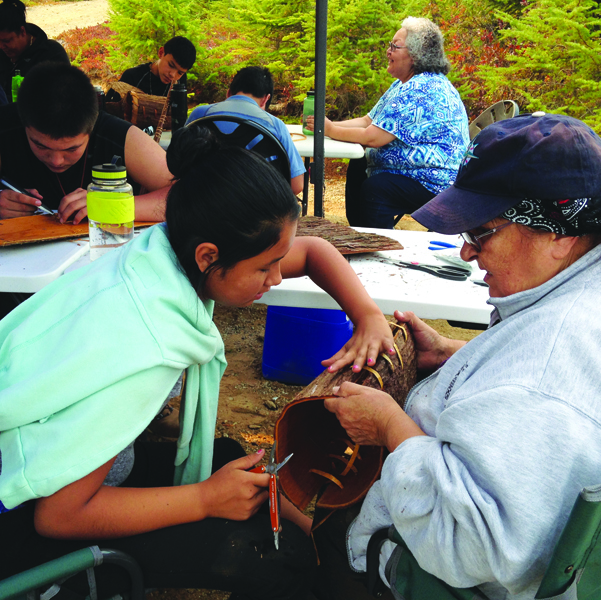 Indeed, the Tulalip elders and volunteers added to the overall experience of the youth; helping to explain how their ancestors were one with their environment and lived a fulfilled and spiritual life, all without the uses of cellphones, computers, T.V., and the internet. 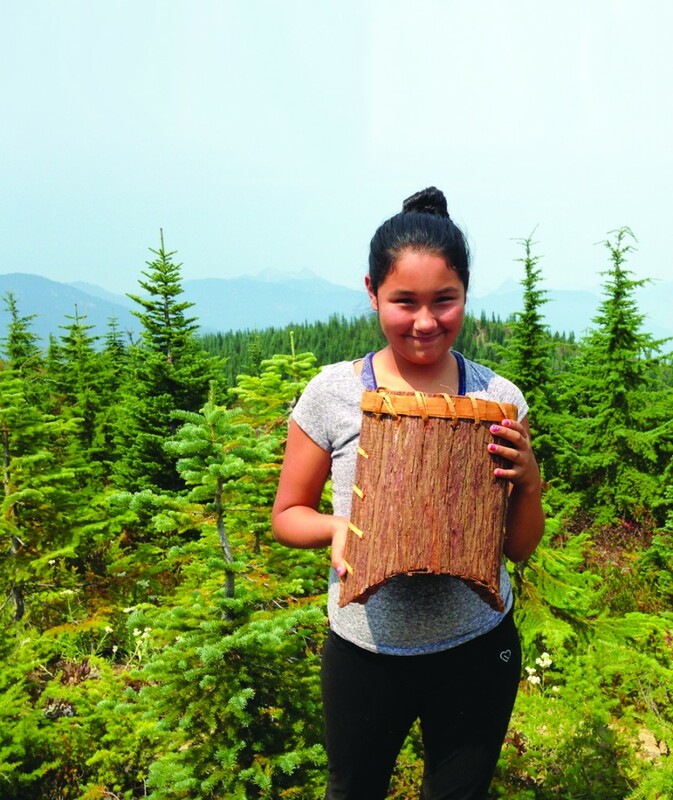 A true highlight was the elders teaching the youngsters how to make their very own cedar baskets so that they could go huckleberry picking during their brief stay in the mountains. 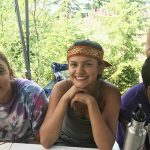 The messages of finding strength and beauty in all experiences with nature were taken in by the youth and each did his and her best to internalize those values. “The elders have been telling us stories about what they used to do when they used to go berry picking, and how it was tradition that they make it look like they weren’t even there. 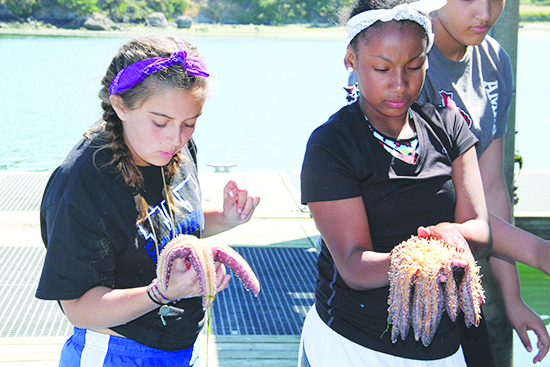 They just picked a little bit and moved along,” explains camp participant Jacynta Myles. 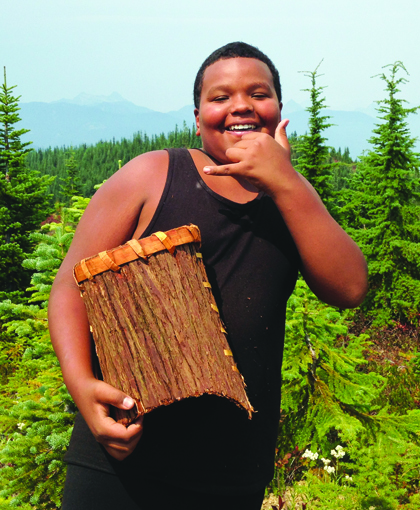 “They made cedar bark baskets and used them for berry picking baskets. You can go from blackberries to huckleberries and store practically anything in it. For the tribal elders and everyone involved who contributed to making Mountain Camp a reality, it was a dream come true to witness the camp youth as they one-by-one grasped the importance of walking in their ancestor’s footsteps. 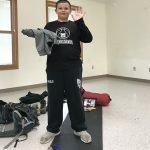 The entire project had been in the works over the last few years, allowing Natural Resources the necessary time to find funding and the resources to build a Mountain Camp program for our youth. “This, as the first year, was a big learning experience for all of us. 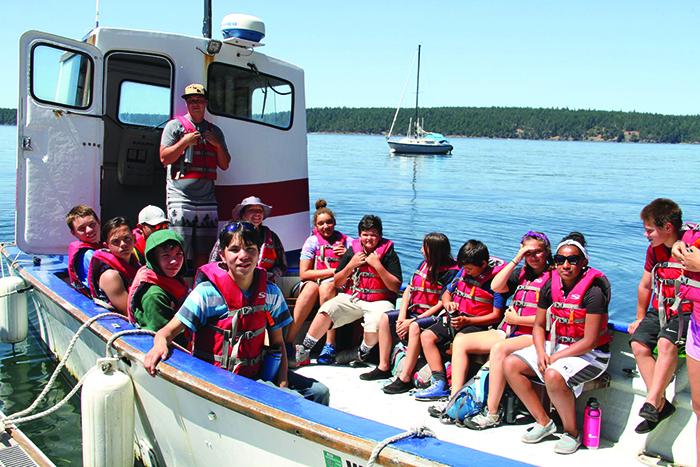 While there are things we might tweak for next year, overall we believe this first year was a big success and deeply worthwhile, as measured by the experience these eight kids received and all that we, as program leaders, learned as it unfolded,” said Libby Nelson, Tulalip Environmental Policy Analyst. 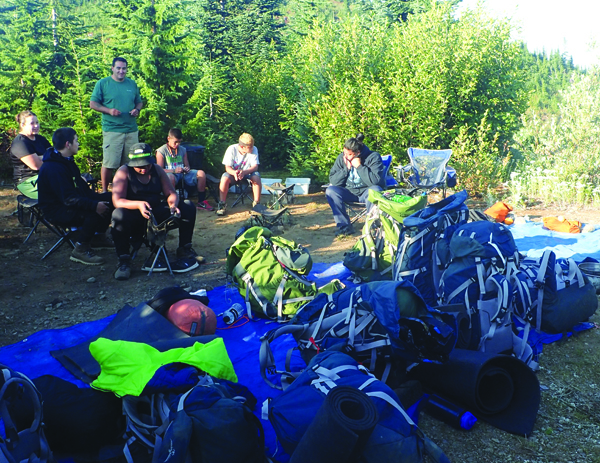 “Success this year can be attributed to the collaboration with our Cultural Resources, Language and Youth Services staff; and a very successful and helpful partnership with the YMCA Outdoor Leadership Program in Seattle, the US Forest Service, and our own Rediscovery Program in Tulalip’s Cultural Resources division. From practically being inside a thunder and lightning storm at an elevation of 5,000 feet, to storytelling in their Lushootseed language as they witnessed a meteor shower, to creating their own cedar bark baskets for huckleberry picking, the Tulalip youth created many memories that will last a lifetime. As they grow and mature into adults, their sense of appreciation for what they were able to be a part of and experience will undoubtedly grow immensely. It’s a difficult task for anyone to be expected to live as their ancestors lived, let alone asking that of a 7th or 8th grade student. 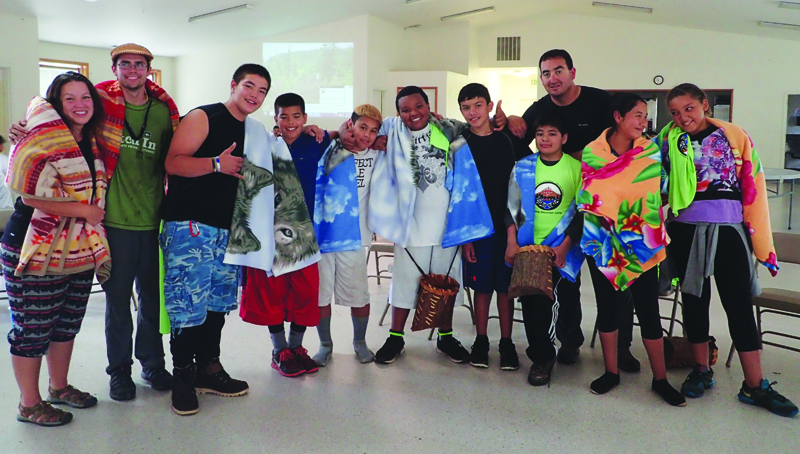 In honor of their efforts and achievements while participating in Mountain Camp 2015 the youth were honored with a blanket ceremony when they got back home to Tulalip. 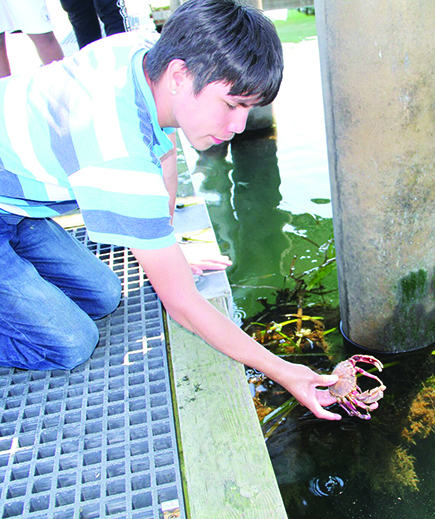 “The ceremony was to acknowledge what the kids went through. It was an accomplishment for them to go through everything that they did while up in the mountains, living in nature,” continues Inez Bill. “They didn’t have their cell phones or any of the other electronic gadgets they would have back home. They experienced something together, they grew together, and they had a rite of passage together. 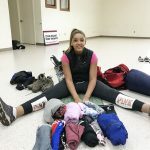 I covered the kids with blankets as a remembrance of what they went through. The ceremony recognized that rite of passage, of how we want them to be as young people. Plans are already underway for Mountain Camp 2016. 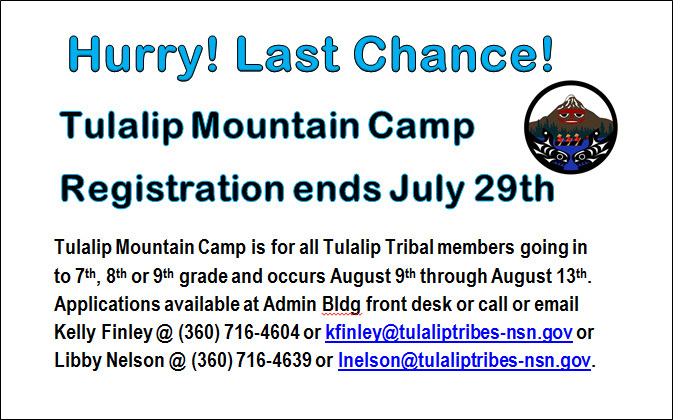 Stay on the lookout for more details and registration information in future syəcəb and online on our Tulalip News Facebook page.